Acute renal failure (ARF) or acute kidney failure refers to the sudden failure of the kidneys to perform normal filtration duties. This is not the same as the much more common form of kidney failure, chronic renal failure (CRF). ARF leads to accumulation of toxins and other metabolic wastes in the bloodstream, dehydration, electrolyte imbalances and disturbances in the acid-base balance of the blood. ARF is potentially reversible if diagnosed early and treated aggressively. Older cats are at higher risk for developing ARF. "ARF is potentially reversible if diagnosed early and treated aggressively." What are the clinical signs of acute renal failure? The clinical signs of ARF may include sudden anorexia, listlessness, vomiting (the vomited material may have blood in it), diarrhea that also may contain blood, a strange breath odor, and/or seizures. Some cats will urinate more frequently while others may not be producing any urine at all. There may be a recent history of ingestion of a toxin (especially antifreeze) or of recent trauma, surgery or illness. Many cats are in shock by the time they reach the veterinary hospital. 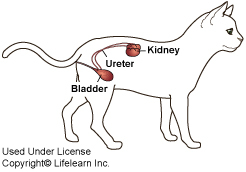 The veterinarian will frequently find enlarged and painful kidneys during the physical examination. Diagnosis is based on medical history, clinical signs, and the results of blood and urine tests. Other diagnostic tests may include abdominal radiographs, abdominal ultrasound, radiographic contrast or dye studies, fine-needle aspiration or surgical biopsy of the kidneys. Treatment is focused on removing the circulating toxins as quickly as possible and restoring electrolyte balance. This is usually accomplished by administering intravenous fluids for twenty-four to ninety-six hours (1 to 4 days). Peritoneal dialysis and hemodialysis are rarely performed, but may be available in your area. If toxin exposure or a drug reaction is suspected, it is recommended that the stomach be emptied of its contents immediately, followed by administration of activated charcoal to prevent further absorption of toxins. Nutritional support may be required in cats with persistent or uncontrollable vomiting. Your veterinarian will recommend an aggressive treatment plan to give your cat the best chance of recovering from ARF. What is the prognosis for a cat diagnosed with acute renal failure? "Acute renal failure is a serious and life-threatening condition." The initial prognosis is guarded for all cases of ARF. If the cause is an infection, there is a better prognosis than if the cause is a toxic substance. The long-term prognosis for recovery depends on the amount of kidney damage that has occurred. The kidney has very little capacity to regenerate or "heal" itself, justifying the guarded prognosis. Your veterinarian will provide you with a more accurate prognosis based on your cat's clinical signs and individual condition.